MicroSwiss is a small machine shop in Naples, Florida, that's always looking for a better way to do things. 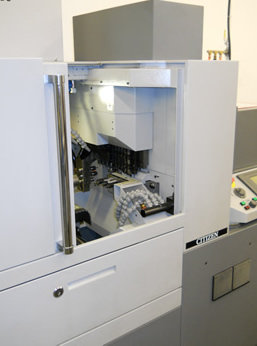 The company focuses on the manufacture of medical devices, and currently runs one Citizen A20 and three L20 CNC Swiss lathes. The latest "better way" development to come from this shop is a unique and effective solution to a customer's request for a burr-free, tight-tolerance part. The immediate reaction of Jeff Bonner, Shop Owner, was to consider the use of a grinding wheel in one of the Swiss-style screw machines in use at MicroSwiss. The evolution of this idea into a full-blown exceptionally successful product is described in the December issue of Production Machining magazine. This application has helped the company double their part production, with a superior surface finish, compared to previous processes. Based on the successful use of this technology in the company's manufacturing processes, MicroSwiss is making the tool available to other shops. The process was developed to work on alloy steel materials such as stainless steel, but testing is underway to expand its use to exotic materials such as titanium. This website contains technical product information, as well as an order form for purchasing this tool for your application. 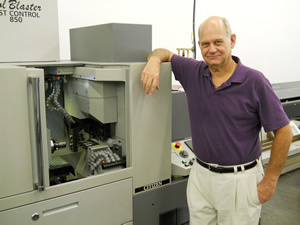 Jeff Bonner established MicroSwiss in Memphis, Tennessee, later moving his operation to Naples, Florida. He has a degree in Mechanical Engineering and has been in the Medical Device Manufacturing business since 1988. He holds five patents in various fields, including medical devices and engine design. © Copyright 2012, MicroSwiss Corporation. All rights reserved.